We have now documented 90 different attacks on the free speech rights of conservatives like us. 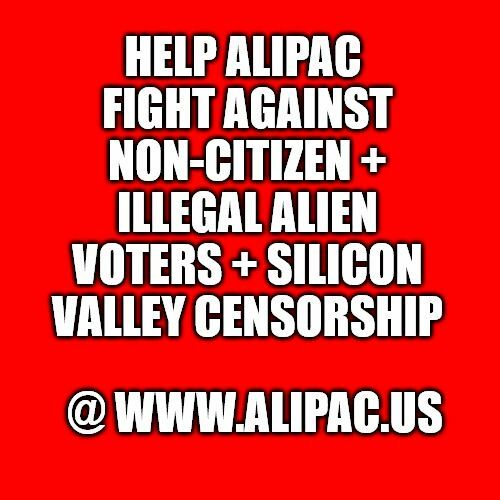 For your convenience, our most important materials are now stored as stickies in the section titled, "Most Popular Discussions & Debates," which we have moved into the #2 position at www.alipac.us just beneath our Announcements. This should allow you to pop in anytime you need to reference these links and post a pathway into our collections during Facebook, Twitter, or email battles to raise awareness. You can use our onboard share features at ALIPAC.us, or you can simply copy and past those links in! This is a great way to quickly inform others by email, Facebook, Twitter, GAB, LinkedIn, Reddit, Tumbler, etc. We are adding new conservative victims of Silicon Valley to the bottom of the list. You can then drop down beneath the list to access links to the source we used to add victims. Yes, they just found over 95,000 illegal voters in Texas and 11,000 in Pennsylvania. (View) That means this week we need to update our illegal alien and non-citizen voter evidence list and fire it out to our networks and the media! Last edited by ALIPAC; 02-03-2019 at 01:52 PM. "Silicon Valley Treats American Workers Like H-1Bs"